The Swords and Spirits update will see new game mechanics. Find out more about what will change! There is a lot of information to unpack in this article, so we’ll go step by step. Today, we’ll be focusing on three main topics: Gear, Stats, and Collections. We’ll go over what is changing and how these changes will affect your experience. To start off, we’ll talk about something a lot of players have been wondering about: the level cap. The level cap will be increased. The new highest level you can achieve is level 100. We still want players to go through the experiencing of reaching this new level cap, so all players at level 65 will remain at 65. If you’ve amassed enough experience at level 65, you will be bumped to 99% of getting to level 66 when the Swords and Spirits update is live. This will give experienced players a slight advantage, but will still allow for everyone to experience the new level cap system together! The % to level 66 depends on how much experience a player has over the current level 65. Experience requirements for levels will also change a bit. Don’t worry though, everyone will be adjusted to keep the same progress to their next level if you aren’t maxed. This means, if you’re level 40 and are 50% to 41, you’ll still be 50% to 41 in the new update. We mentioned this in a previous article, but we thought we’d go over it again in case anyone missed it. On the stats page, you have two stats called Health and Defense. In battle, your health is turned into HP and your defense is turned into your Shield. It’s also worth mentioning that your Shield and HP are x5 your Defense and Health stats. This means if for example, your Defense stat is 50,000… then your Shield in battle will be 250,000! 72,700 Shield in this example means a Defense stat of 14,540. The Health stat would then be 12,370 to equal an HP of 61,850. In the new update, the level cap for Gear and Orbs will no longer be x2 your Hero Level. Instead, the new level cap will be x1 your Hero Level. This simplifies things and means that whatever level your Hero is, that’s the maximum level you can upgrade your Gear and Orbs to. Player’s Gear that is at level 130 will revert to level 65 when the new update arrives. Gear that is over level 130 will be granted additional levels depending on how many levels over 130 they are at. Level 131 will start at 66. Level 132 will start at 67. Level 133 will start at 68. Level 134 will start at 69. Level 135 will start at 70. Upgrading Gear will now also give you more Reforge points per level than before. For those who currently have their Gear maxed out, you will receive the difference in Reforge Points you would have gotten with the new system. The maximum upgrade for Gear will now be level 100 and there will be no over-leveling. It is also worth noting that any upgraded Gear that is Divided after the update will still “remember” how many resources you put into that Gear, even though the levels have been changed. If you had a level 100 Gear that turned into level 50 after the update, you’ll still get the same Eternium back when Dividing it as you would normally get before the update. Gear will now have higher potentials than before. For example, the Thunderbear Armor has a potential of 76 in the old version. In the new update, this same Gear will have a potential of 182. This will affect some calculations and Hero Power, but ultimately, the best Gear in-game will still have the highest potential compared to older/weaker Gear. Since upgrading Gear will now give more Reforge Points than before, in the new update, Boosted Gear will no longer grant you additional Reforge Points. Another change to Boosting will be that each Boost will now give less additional stats to Gear than before. Since Boosting Gear is the only way to Reforge items in the Collections, this leads us to our next topic… Collections. In the new update, the bonuses you receive from the Collections will no longer go into each individual Gear’s stat. Instead, it will go directly to your Hero. This means, if you have a Defense bonus of +1000, your Hero will receive +1000 Defense, instead of the 1,000 being applied to each Gear individually. Because of this change in calculation, un-upgraded Collection slots will have a starting base % of 75% (versus the old 10%). The new maximum percentage per slot will be increased from 45% to 250%. All Collection slots will be adjusted accordingly, meaning if you have a slot at 45%, in the new update you will have the maximum 250% boost for this slot. These changes to Collections will now make them more user-friendly and easier to understand. When the new update goes live, all items in your Collections will be un-docked and placed into your Items tab. Since Boosting will no longer give you Reforge Points, Reforge Points that were spent on an item prior to the update will be displayed as a negative value in the Reforge menu interface for these items. 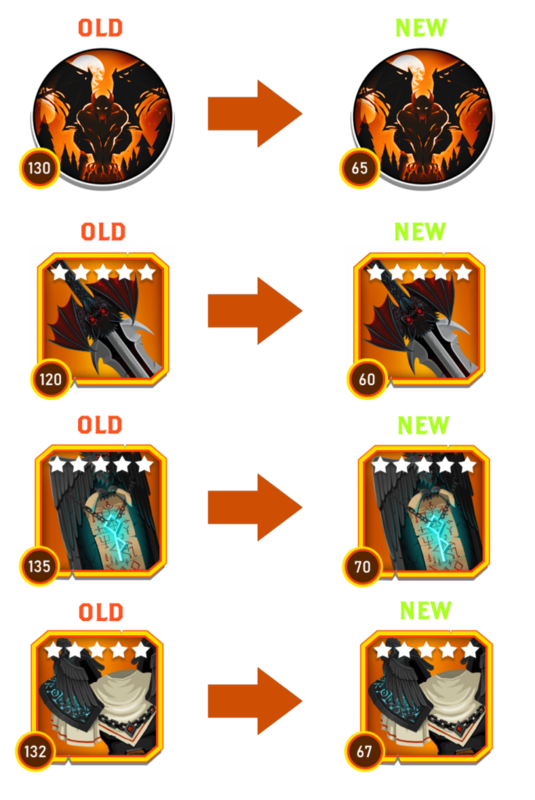 Upgrade the Gear until the amount of Reforge Points from upgrading balances out and pushes the RP to a positive value. If you decide to go the Dividing route, once divided, you’ll receive a percentage of the Reforge Powder used to Reforge this particular Gear (depending on what kind of Divide Token you use). The Gear’s stats will be reverted to it’s base stats as per usual. Gear’s Bonus links will also be changing in the new update. Instead of there being five bonus link possibilities per Gear item, there will now be just two bonus link possibilities. For Gear, you will need 2 out of the 3 Gear items to activate the bonus, and for Orbs, you’ll only need to dock 1 out of the 2 displayed to get the bonus link. In the old version of Questland, there are 35 total bonus links for you to activate. Because we’re reducing the amount of bonus links per Gear from 5 to 2, this means that there will be just 14 total bonus links to activate in the new update. We decided to change how Bonus Links work because players have been wanting a way to quickly “swap” between different Gear. To efficiently swap from one build to another (Warrior to Mage), you would not only need to change your Equipped Gear, but also change the Bonus Links tied to each Gear, meaning changing Orbs and change some aspects of your Collections to match your new build. With fewer Bonus Links to worry about, this means you will have more room for items in your Collections that will link to multiple sets. Your docked Orbs for one type of Gear, for example Armor, can have a Health Orb that gives one bonus for one type of Armor, and an Attack Orb the gives a bonus for another set’s Armor. Once docked, you can easily switch between those two Armor pieces knowing that you will still activate its bonus link! We’re all familiar with the three Orbs in-game: Attack, Health, and Defense. Where is the Magic Orb?! Well, we’re happy to say that in the Swords and Spirits update, the Orb that is now known as “Attack” will change so that instead of adding Attack stats, it will give both Attack and Magic stats! Think of it as a damage Orb in that upgrading this Orb will give you +Attack and +Magic. We hope these changes to Bonus Links and Collections will allow new players (and old) to more easily understand how these aspects of the game work. If Text Isn’t Your Thing, Here’s A Video On The Subject! If boosting equipped gear does not add to reforge points then what is the benefit to it? Is a +10 not better than a +1 or are stats still nominally increased? Hello. Boosting still gives additional stats, so a +10 will be better than a +1 item in the Collections. Hello Deviroth. All our time has been focused into this update. We do have plans on optimizing the game to provide a better experience for all players though! I’m on an Ipad 4 and the game closes all the time and is very slow moving between screens. After gameplay I hope this is the ne t issue that is addressed. Hello. Yes. This will still be the same. Can still only level 1 items be put into collection slots? If so, items in collection can no longer be reforged? And does this mean that the boosted level 1 items with reforged stats that were previously a part of a collection can no longer be put in a collection slot? Hello. Boosted level 1 items with reforged stats will still have their reforged stats, but once placed in the Collection slots, the Collections will automatically use the base stats of the Gear and ignore the reforge bonus. Same applies for any items over Level 1. Only the base stat of the Gear will count towards Collections. How does that reconcile with this comment where you write “the Collections will automatically use the base stats of the Gear and ignore the reforge bonus. Same applies for any items over Level 1”? 1. What is the benefit of boosting equipment in collections, if any? 2. What is the benefit of upgrading eq in collections? Hello. We’re sorry for the confusion. 1. The benefit of having Boosted Gear in the Collections is that Boosted Gear has higher stats than unboosted Gear. 2. There is no benefit in placing upgraded Gear in Collections. Just like now, any upgraded Gear placed in the Collections will use the base stats of that Gear, regardless of its level. 3. It is impossible to Reforge Gear in the Collections in the new update. The Collections will ignore any additional Reforged stats from a Gear that is placed in a slot. We hope that answers your questions! Thanks, it does in part, and I appreciate your responsiveness. If reforging collection items has no effect, why the reforge deficit? 1) Why would we be penalized for a pre-update action, and 2) What impact would this deficit penalty have, since reforges are irrelevant to collection items? So with the new gear leveling, is the amount of eternium used to level up to say 100 going to be the same amount needed to level up to level 50 after the new update? If so then to get to level 100 after the update will take a huge amount of eternium. And if that is not the case, it seems that you will be able to divide old level 100 gear after the change and then have enough eternium to upgrade way past the level 50 it will default to after the update. Would either of these cases be true or did you guys have another way to fix this issue? Hello. Put simply, the game will “remember” how much Eternium you put into a Gear. Even if values change for the amount required to “level up” Gear, you’ll still get back the same amount of Eternium you would if you would have Divided the Gear in the “old” version of Questland. So, after the update, will everyone’s hero power drop considerably or will the decreased leveled items still carry the same stats? I.e. if a level 130 sword having 6000 health 5000 attack 5500 armor and 8000 magic, will the level 65 sword have the same stats or will everything be decreased accordingly? Hello. Stats for Gear will change but they will all change proportionally to their level. The stats will be “translated” into the new version. With items being automatically removed from Collections, you may notice a drop in Hero Power, but once you put these items back into your Collections, you’ll see your Hero Power go back up! Currently players are encouraged to divide gear when placing it in collections, meaning that some expended resources are lost when equipping gear from collections and placing equipped gear in collections when changing build. Does the update allow fully upgraded gear to be placed in collections without penalty? Hello. This update will not allow upgraded Gear to be placed in the Collections, but the lowered amount of bonus links needed per each Gear item means that you’ll be able to set up your Collections to be compatible with multiple setups/builds. With items being moved from collections and consequent drop in hero power until they are refilled, will the arena be disabled for a period of time? 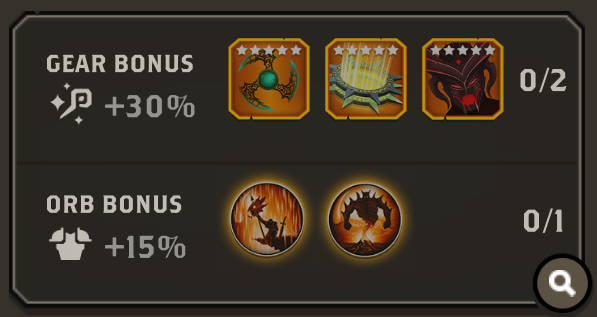 What about % given by scrolls I & II ? Should I spend them now to get a bigger % that will then be adjusted accordingly or should I keep them for the post-update ? Will the rates be better or will they be the same, adjusted ? These % rates will be relatively the same and will be adjusted to the new system. There is a slight advantage to using them now versus in the update, but it is a very small difference. Someone ask you before and you answer about the collection, but what about the stuff equiped. « Manticore Armor » no boosted with a high potential become much better than an « Atlantis armor » boosted +10 because the boost don’t give lot of stats and no reforge point ? Hello. Thank you for sticking around and we’re glad you’re looking forward to the update! The Boosted Gear in your example will be better than the unboosted Gear. We want to let you discover the differences and play around with the armors and stats yourself, so that’s all we’ll say! I am not sure if this is intentional, but I would like to know why you removed getting back orb enhance points. I tried to enhance an orb with an other +3 orb and it only gave 50 points instead of 350 (I think it was half of the invested).